I have just returned from Josh. I have been visiting Joshua Tree NP biannually since 1977, back when it was originally classified as a national monument. Most of these visits are to a backcountry dry camp far from other campers and hikers. I have noticed changes occurring to this area going back decades. Back in the day the main road through Joshua Tree NM was a meandering narrow two laner of worn and patched asphalt; it is now a well maintained way. If one wanted to car camp they could usually get a site, but once declared a national park the visitor count went way up, and the car camp loops were frequently occupied solid during the season. Facilities other than the road have also upgraded, but some of these changes are superfluous, perhaps even counterproductive. Take development along the Boy Scout Trail for example. This is a trail that takes you from the high section of the park to one of its lower sections. The upper part of the trail used to be a double track to Willow Hollow. Later this was fenced off from vehicles before I first hiked there. The trail waned into a single track about two miles in, and remained Spartan in its route with minimal signage. 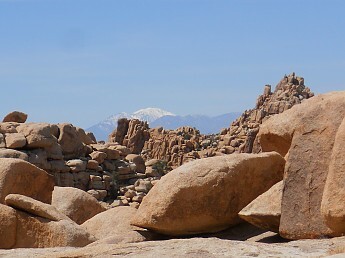 Climbers and other enthusiasts named the various individual piles of rocks along the way; later the Park posted signs guiding the map and compass challenged to these many waypoints. Now the BS Trail is a path wide as a double track, with obvious side trails diverging wherever a named destination rock pile occurred. Think backcountry interstate signage. While width of the path may be due to increased park activity, the side trail diversions are mostly a “if you build it they will come“ kind of thing. It is not the intended side track that is the issue, however; it is the individual meandering off trail routes through the scrub people walk while returning to the main trail, which compromise the soil’s ability to retain water. En masse these are having an effect. We are loving the park to death! One can witness the passage of time on a grander scale, as illustrated by this image taken in fall of 2010. 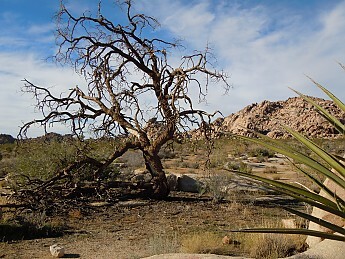 This tree, a deciduous species, located in Joshua Tree on the Boy Scout Trail near a rock formation called Outer Mongolia (a climbing area seen in background), was healthy in 1977. It has been dead since 1995. Many other trees have succumbed to the current drought throughout the park. Evidence of drought effects are discernable everywhere to the knowledgeable eye. The green shrub lurking behind the dead stag is a live oak tree, and has doubled in size since 2010. On a larger scope, Joshua Tree has been in a desiccating phase for almost twenty years. When we first visited, road runners darting in the scrub and washes were a regular sight; I think I’ve seen only one in the last ten years. The coyotes used roam in packs and howl while on night patrol. Now conditions compel the pack to disperse, their numbers in decline, and their desperation evident in the frequent day sightings as they comb the roads for road kill. No more howling at night, it is safer to be stealth as a solo lobo. Kangaroo rats once a common occurrence just beyond the camp lights, are now seldom to be heard. And that’s odd since they need next to no water, and there is plenty of seed grass to stock. Just over the nearby rock crest where we camp a sandy wash once supported community of cactus pear eating iguanas. I have seen no trace of them in decades. Even the bats are less numerous. The mix of foliage has also changed. Trees are dying faster than they are being replaced. Including Joshua Trees. And the josh trees surviving have less foliage volume on each crown, and fewer crowns per plant. 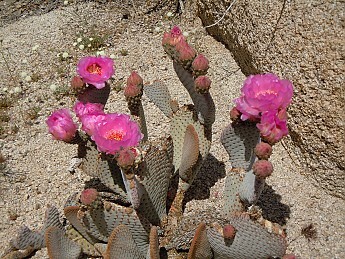 Certain cacti are in severe decline, while most cacti are in survival mode and a few are doing well. I noticed the barrel cactus definitely multiplying as are several of the beaver tail spicies. Not all of the fauna are doing badly. The small size lizard breeds seem to be holding their own, and we have a succession of owl pairs that have held the territory near our camp for generations. (I guess there are still some kangaroo rats after all!) And while the large hares have declined in numbers, they have shown a recent up spike, given improved conditions and fast population recovery rates. 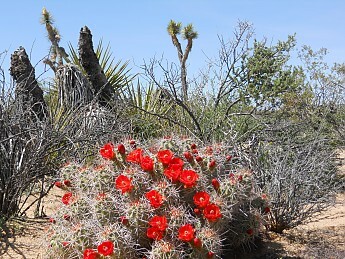 On this trip we hit Joshua Tree after most of the annuals bloomed. There were a few left overs, but mostly it was the daisy like small yellow flowering plants that made carpets of color here and there. The Joshua Trees and yuccas were ¾ through their flowering cycle, while only a few breeds of cacti are starting to bloom, the rest hopefully later. Usually the green season is rather brief, but it seems this year to be spread over a wider period. We had a breeze the first night, but otherwise the day and night temps were perfect for us human visitors. One of the prettiest blooms seen on our trip was just yards from the trailhead. Yes, those lavender flowers are iridescent and delicate as they appear. My friend Jack mugs for the camera. Looking SSW from overview just west of Outer Mongolia. Boy Scout Trail passes below, left to right, along near edge of the plain. Key’s Ranch and the park’s high country car camping sites are hidden behind the dark rock formation that blocks the horizon at left center of picture. The main road through the park passes left to right behind the rock formations that split the broad plain. Enlarge image by clicking on the image, then selecting view original. Below are several studies of Mt. San Gorgonio, the highest mountain in So Cal @ 11,503'. 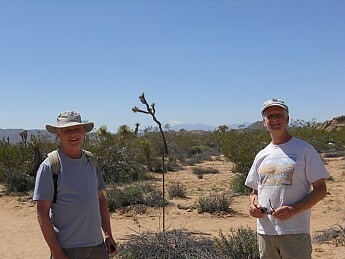 A college friend, Andy, and I on the Boy Scout Trail, San Gorgonio on the horrison to the west. Another San Gogonio shot (best seen enlarged by clicking on the image, then selecting view original). Old timers will disearn the Joshua Trees are not as robust as they used to be. Mt. San Gogonio from Wonderland of Rocks. Thanks Ed. I moved to California in 1972 because the waves were better. Joshua Tree in the 1970s was the place to be in the winter time. It was easy then to drive the dirt roads and not see even another dust trail for 3 or 4 days. Now I am reluctant to visit because it is on the map and a NP. There are plenty of nameless places in the Mojave Desert that are still like JT used to be. Great report Ed. Sincere thanks for sharing this! I read of the climate history, but do not recall the general narrative. Indigenous populations have inhabited the region continuously for centuries, so some of the history predates formal record keeping. Geo-climatologists describe it as a region that has transformed greatly through the eons. On that scale the region is very dry, compared to periods where it was once a verdant savannah. As for the more recent dry seasons being part of climate change - that is for climate historians to judge. 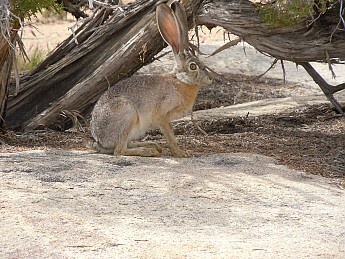 I remember watching the joshuas going dead across the mojave over years of Vegas runs when we lived in CA. Not sure if that would have been the previous drought or if this one just lasted for over ten years. It was sad to see them dying off one by one, but life in the desert is no picnic. Nice to see the cactus pics though Ed. We don't have a lot of those up here. Looking at your report I could almost smell the wind blowing sun cooked sage my way :) Thanks for posting! One of the characteristics of dry climates is variability. 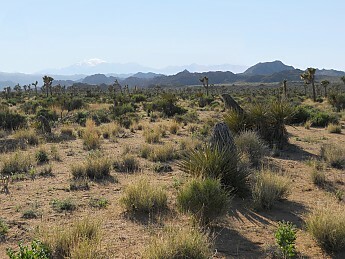 The naturally occurring range of precipitation and temperature in the Mojave is much greater than the small, but measurable range from changes in the climate. It is totally normal for plant species to have ranges that expand and contract over time.